I'm tenatively planning a short trip to Ireland, and I wanted to inquire about things I should go to see relating to the medieval period. I'd like to see a castle or two while I'm there; the older, the better. My favourite period is the 12th century, although I imagine most of the castles there that survive are probably from the 13th century, with later additions. Also, if there are any good general museums with significant sections from the medieval period, I'd like to see them. Finally, if there's any particularly good place to see arms and armour, I'd like to know about it. I imagine Dublin is probably best for arms and armour; I understand the city has the largest collection of Viking swords outside of Scandanavia. Any other recommendations from the High Medieval period are welcome. The Museum District in Dublin is your best bet for arms and armour. They have some fantastic exhibits. Sadly, I didn't have my camera last time I was in there, or else I'd post pictures here. Oh well, I'll be sure to bring it next time. As far as castles go, where do I begin! There's the (in)famous Blarney Castle in County Cork. If you go to Heuston Station in Dublin's city centre, they have regular trains to and from there. The trip takes a couple hours. Once you're in Cork Kent station, Blarney is just a short bus ride away. The bus station itself is only about a five minute walk from the trains. Iarnród Éireann has trains that run throughout a good portion of the country. Mallow, Thurles and Limerick-junction are along the Dublin-Cork route and should have some places that would interest you. Anything you can't get to by train is easily accessible by bus or ferry. If you're interested in Belfast, Connolly station, also in Dublin, has a fairly regular train schedule as well. I hope this helps, and I hope you enjoy your stay on my island... and yes... it is mine. Ross Castle, Co. Killarney (this one was probably my favorite in overall "atmosphere" simply because of its location in a lough in the Killarney National Park and its beautiful remants of old-growth forests. And, there is of course Blarney Castle, which was already mentioned. There are many other castles in Ireland, some of which are very nice, some of which are really just very late reconstructions and some of which look more like manor houses (to me) than castles! But that's just my opinion, and really my favorite things to see in Ireland aren't the castles. I rather enjoy sites of natural beauty, such as the magnificent Cliffs of Moher, Killarney National Park, prehistoric sites such as Newgrange, and also whatever standing stone circles, cairns, dolmens, and hill forts that remain. I also like seeing the various round towers, looking at the sculpture on many of the earlier Irish stone crosses, and trying to catch glimpses of the the Book of Kells in Trinity College, Dublin. But then I'm more of an early medievalist (Viking age is the latest I usually go!) so that explains that. But anyhoo.....have a wonderful trip and take many photos, especially of Viking weaponry! I have not yet had a chance to see any of it in Ireland myself. Wow! Seems like your question's been pretty well answered already! I'm studying abroad in Ireland at the moment and our Spring Break is coming up. I'm hoping to see a castle or three as well, so I'll let you know how it turns out. A lot of monasteries are worth visiting as well. I've been told the Aran Islands have some great medieval masonry, and there are many other monasteries on the east coast that have Viking history as well. If you can, try and make a trip to Galway in the west. A truly beautiful part of the country, also where I lived for 6 months. Have a great trip. PS. You won't have much trouble finding castles. Thanks for your responses everyone. Jon, can you recommend any museums in particular in the Museum District? While I do admire Viking weapons, as I said before, my favourite period is the 12th century, so any museums with a good selection of high medieval swords and the like are of interest to me (although I also like 14th and 15th c weapons too). Shayan: I know what you mean about short trips. In many ways, they can be immensely frustrating because you get to see so very little of a country. But, on the other hand, having incentive to come back again is a good thing! Since I'm probably only going to be there for five days, I've basically decided to limit myself to two castles and the museums in Dublin, in part because I am not travelling by myself. Inevitably, some compromises will have to be made. If all works out, we'll be flying into Belfast, which means that Carrickfergis Castle is definitely on my list due to its close proximity. Although Blarney looks nice, it's too far away to be feasible in my opinion. Rock of Cashel is almost certainly going to be the other castle on my list of "must see" locations, owing to the large amount of 12th and 13th c architecture it has, and the museums and displays about the Celts that it has. While it is quite a distance from Belfast, I really want to see it if at all possible. If going to the Roch of Cashel doesn't appear feasible though, I'll probably go to Dunluce instead. Dunluce is quite atmospheric, as is all of Antrim around that area.....you won't be sorry you went. The national museum is your best bet for weaponry....it had many viking era swords and a few later medieval (including one interesting one with a hilt almost exactly like Albion's Solingen). The main problem was that they didn't allow photography...so bring your sketchbook. Best of luck and enjoy Ireland...it's a beautiful place. Jon, can you recommend any museums in particular in the Museum District? While I do admire Viking weapons, as I said before, my favourite period is the 12th century, so any museums with a good selection of high medieval swords and the like are of interest to me (although I also like 14th and 15th c weapons too). The National Museum of Ireland has what you're looking for. There are good examples of arms and armour from the medieval period (and the Viking period as well). You might want to check out the Natural History Museum as well. No arms or armour obviously, but it's still worth a visit. Although, depending on how short a trip you're taking, you'd probably be better off putting it on your "next time" list to go visit one of the many castles. Shamsi provided a pretty comprehensive list there. Craig, when you have returned don't forget to tell us about your trip to Ireland. How about this - You take pictures of Irish arms and armour and post them here at myArmoury.com. We'll be waiting. So, in regards to transportation, there should be no difficulty getting places by bus or train then? One thing I'd like to do is come up with a budget for this trip in advance, so I'd like to have an idea on how much to expect for transportation. I know things aren't cheap in the UK. Supposing I arrived in Belfast, can anyone give me a ballpark estimate of what it might cost say to travel to Carrickfergis Castle, Dunluce Castle, Dublin, and Rock of Cashel? Or, failing that, can you at least give me a few price ranges typical for both trains and buses? Also, on the assumption that prices in Ireland are generally fairly similar to the UK, I was budgeting roughly 20 quid per night for hostels, and 25 quid per day for food (or the equivalent price in Euros). Does this seem reasonable? Can anyone tell me about the medieval display called "Dublinia" and whether or not it's worth going to in Dublin? No, you shouldn't have any trouble getting around. In fact, it's easier to get around by train and bus than car most times. The M50 is a glorious mess. As I haven't traveled to Belfast in quite a while, I can't tell you how much the train ride would cost to Dublin, but the Dublin-Cork route is approximately the same distance and costs something around €65 round trip. Buses are pretty affordable. You would only really use them for short trips anyhow. So don't look to spend more than say €20 at the most per trip. Here are the sites for Iarnród Éireann: http://www.irishrail.ie/home/ and Bus Éireann: http://www.buseireann.ie/site/home/. They should give you a better idea of what you can expect to pay. As far as food goes, I can tell you that 25 quid a day would do you alright if you eat light and you're not planning to go to a formal restaurant. I'm afraid I can't give you much information about lodging though. When I travel, I usually stay with one of my mates or family. I don't think 20 quid a night is quite enough, but, again, I'm no expert. I hope this helps. Dublinia was interesting, but essentially a children's/very general knowledge display. It is essentially a wax figure museum with interactive sounds etc recreating several different era's of Dublin's history, from a Medieval market to a shipyard and viking longship. Don't get me wrong, it was amusing and would probably be great if you have kids, but since it sounds like you are limited in time, I'd say spend the extra time in the National Museum. In Belfast these days you can get a hostel from 6.50 (pounds) per night to 12, depending on how many roommates you want to share with. Food wise I found 15 pounds to be quite sufficient per day. Buses are the best mode of transport, I feel. I'd second the Bus Eireann recommendation. I think it was only something like 35 euro for a round trip from Dublin to Belfast and back. I'd second (or third?) the recommendation for Cashel Rock. I spent quite a bit of time in Ireland and I think this was the best example of the period you are interested in that I saw. Last time I was there however, they were in the process of some major reconstruction and it was hard to see a lot of the castle. That was about a year and a half ago, but it might be worth your while to see if you can find someone from the area to tell you if you will be able to get in there or not before you make the trip. If it is open, I would also recommend that you spend the night in Cashel. If it is still like it was the couple of times I saw it, they light the castle from the inside at night and it looks quite spectacular from a distance. Enjoy your trip. I have never been to the emerald isle but I will go some day. As we share an interest in the same general period (1000-1200 for me) I am used to the sometimes sparse number of specimens. I will say that although I tend towards the 12th century I really have a thing for latter period viking swords. You may be likely to see a brazil nut type X or Xa. These latter period viking swords capture that austere elegance that is so appealing of the High Medieval period. Plus some of these may have been used into the medieval period. Good luck and tell us about it. 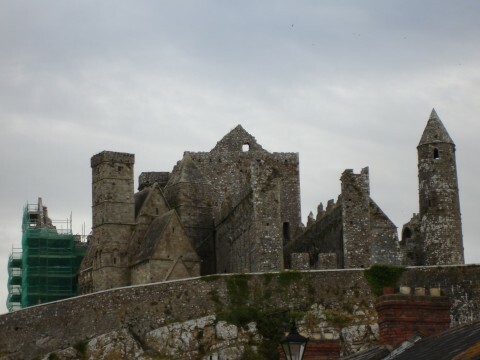 Cashel Rock is located in the town of Cashel. It is about 100 miles southwest of Dublin or about 60 miles Northeast of Cork. If you are heading from Dublin down the N8, you can see the castle clearly from the road. The town is also very nice and has an outdoor theatre stage and an indoor performing arts stage within a short walk of the castle. Also, there is a small ruined abbey that you can see from within the castle. I'm not positive, but I believe it was built around the same time as the castle.